When was the last time I posted a nail art? Last one was this and I reviewed the summer collection "Expressions" from Caronia here. I missed doing nail arts but it seemed that my time didn't let me to do one. 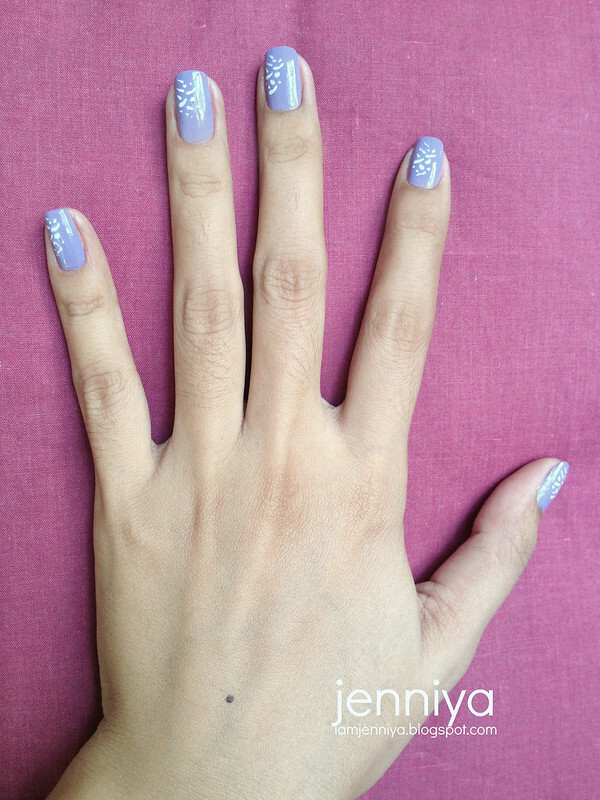 But yesterday, I was able to squeezed in a nail art right after our appointment in Ortigas. Yeap, I work even on Sundays. Do I need say more? Yeap, I'm addicted to anything pastel. I'm embracing the summer colors obviously. This nail polish have sat in my mani/pedi bag for long time already and have used this once only as far as I remember. I love the consistency of this shade. I applied 2 coats only and I'm really loving the result; so opaque. A smirk was drawn on my face when I read the shade's name - First Crush. 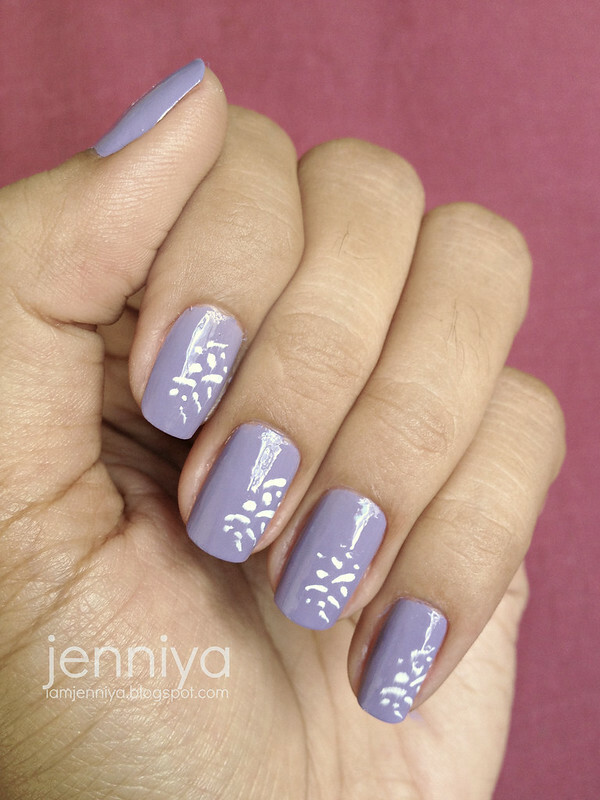 No wonder Caronia named this shade as First Crush because this Lavender speaks sweetness and innocence. So youthful! I love it! I suddenly tried to remember who my first crush was. Hmm... I totally don't remember at all. Haha. How about you? Since I barely have the time and laziness gotten me almost every time I thought of making nail art, I looked for my KONAD Stamping Nail Art. It's been ages since my last time using KONAD and honestly, I miss it. So timely for moments like: "gusto ko ng nail art pero tinatamad ako. Waaahh!". Lol. I bought this KONAD last April 2010. Obviously, when I started blogging. See my step-by-step tutorial in using this kit here. This is very easy to use and time-saving, too. I chose this design over the flowers because I somehow feel overwhelmed already of anything summer-y but hey, I am not complaining. I don't know what this called but it looks like a fireworks. Is it? Huh! That's what you get when you choose things randomly; to figure what the hell it is and have a hard time thinking what to call it. But nevertheless, I find it cute and unique yet simple nail art. (Sorry, this photo is over-exposed. I used my iPhone 5 for all the photos in this post and these were all taken beside my window under natural light). ... with a cute nail art. Don't forget to comment lovelies. I have ongoing activity here in IamJenniya - Be the Reader of the Month for May. Leave some love. Have a good week ahead lovelies! I have a set like this too. Just other motives. I love the result, but it is so much work if you do it for ever finger. love this colour so much <3 great effect Dear ! beautiful, i also want a kit like that! i have this shade from caronia.. kaya lang nabasag ng officemate ko =( its one of my fave color where did you buy your stamping kit? oooh what a lovely shade! I wish I could paint mine as elegantly! I love the color! I love all Caronia nail polishes as well, they're one of the best nail polish manufacturer here in our country,I guess. I've never tried doing nail-art myself coz i have the feeling that I will screw it up, lol!